Christmas time is the season when people consume lots of food without focusing on diet guidelines — the Grenada Food and Nutritional Council wants people to be mindful that the consumption of too much sugar can lead to health problems. “I will not tell people to step back from the culture; what I am going to tell people is to reduce on the amount of sugar, reduce on your portion, and have things in moderation,” said recently appointed Executive Secretary of the Grenada Food and Nutritional Council, Lydia Browne. She is also advocating that parents need to present healthier choices to children, such as fruits. Instead of processed candies, her advice is that parents cut up fresh fruits for the children. Browne, who has was once a dietitian at the General Hospital, also wants people to reduce on salt intake, and advises that people pay attention to labels, and understand that salt is not always mention on the label as salt, but other words are used such as sodium. Admitting that the Christmas time poses a challenge for healthy eating because of tradition, Browne says that persons preparing food can also use other alternatives. “Instead of frying, they can use the oven a little bit more,” she said, also suggesting that coconut milk can be used as a fat replacement. When it comes to drinking, Browne’s advise is for people to drink a lot more water and less alcohol. “Water can replace sweet drinks, and using alcohol should be in moderation. Do everything in moderation” she said. Browne reminds people that it is important to follow the dietary guidelines which have been developed for Grenada. The dietary guidelines, now under revision, states that people should eat foods from all 6 food groups — staples, legumes & nuts, vegetables, fruits, foods from animals, using less fat and oils. Browne joined the Council on 2 December, with 26 years experience in the field of nutrition, 18 of which were spent in the United States at various hospitals and healthcare clinics. Her most recent stint was with the NYC Health + Hospitals. She also served as a nutritionist at the Grenada Hospital Services for 4 years. She is hoping to have an impact in the area of non communicable diseases commonly referred to as NCDs. “I have a passion for working with diabetics, and looking forward to working with the Food and Nutrition Council in ongoing health programs, and eager to explore new ways to improve the health of the population,” she said. Browne has a Masters in Nutrition, is a certified Diabetes Educator, and a registered dietitian. 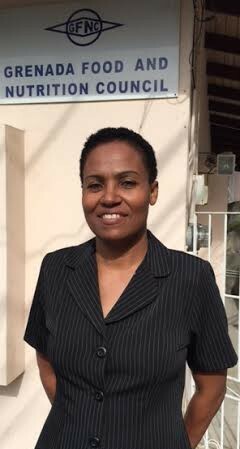 Her appointment is part of the Grenada Food and Nutrition Council’s ongoing effort of fulfilling its mandate to promote healthy living.